Above: My paternal grandmother, Aglaia (Altis) with my cousin, Elpida. Above Middle: My maternal grandmother, Fotini Baltas. Above Right: My father's family. From right, they are: his sister, Eleni, sitting is his brother Stratos and their cousin, Anastasis Dendis. Above: My mother's family. From left, they are: my mother, Antonia; her brother, Aristos and Panagiotis Baltas. Above Right: A portrait of my father, Theophanis Vougiouklis. Above: My family. My husband, Nikolaos, and our two children, Antonia and Panagiotis. Above Right: At our son Panagiotis' wedding. 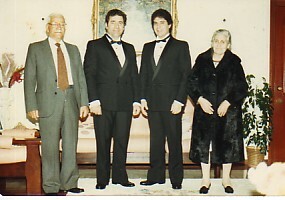 From left, they are: Theophanis, Lefteris Laskaris (the best man), Panagiotis and my mother, Antonia.